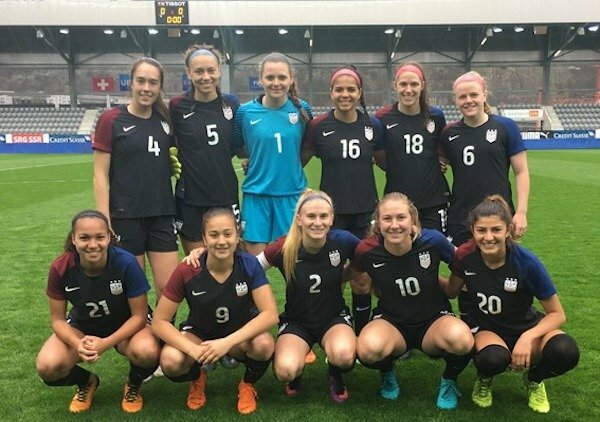 LAFC Slammers' Jenna Nighswonger scored twice in the U.S. U-18 women's national team's 3-1 win over Switzerland, which is preparing to host the Women's U-19 European Championship in July. Pacific Northwest SC's Summer Yates scored the third goal in the win, which came three days before the USA tied the Swiss, 1-1, thanks to a goal by Arkansas freshman Taylor Malham. Coach Jaime Frias' roster was comprised of 13 players born in 2000s and seven 1999s, which is the U-19 birth-year for 2018. The Swiss team included 18-year-old Geraldine Reuteler, who played for the full Swiss national team at the 2017 European Championship. Goals: Alisha Lehmann (Guede Redondo) 80; Malham 18. Switzerland -- Elvira Herzog; Victoria Bischof, Sina Hirschi, Julia Schassberger (Annina Rauber, 46), Lara Mart (Alissia Piperata, 46); Alisha Lehmann, Fiona Hubler (Chantal Wyser, 62), Seraina Piebel (Alicia Haller, 72), Géraldine Reuteler; Amira Arfaoui (Tyara Buser, 46), Sabina Jackson (Ilona Guede Redondo, 62). USA -- Meagan McClelland; Madelyn Desiano, Emily Smith, Maycee Bell, Anna Heilferty (Brianna Martinez, 63); Taylor Malham, Delanie Sheehan, Chardonnay Curran (Emily Gray, 46), Jenna Nighswonger (Madison Murnin, 78), Rachel Jones (Yazmeen Ryan, 63); Summer Yates. Goals: Buser (Piperata) 50, Nighswonger 22, Yates (pen.) 34, Nighswonger 38. Switzerland -- Elvira Herzog; Chantal Wyser, Julia Schassberger, Leana Zaugg, Lara Marti; Malin Gut, Rahel Tschopp (Seraina Piebel, 46), Fiona Hubler (Alicia Haller, 78), Alissia Piperata (Ilona Guede Redondo, 68); Sabina Jackson (Amira Arfaoui, 61), Tyara Buser. USA -- Claudia Dickey; Madelyn Desiano, Emily Smith (Messiah Bright, 72), Maycee Bell (capt. ), Anna Heilferty (Brianna Martinez, 46); Summer Yates, Delanie Sheehan, Chardonnay Curran (Emily Gray, 60), Jenna Nighswonger, Rachel Jones (Yazmeen Ryan, 46); Loren Sefcik. GOALKEEPERS (2): Claudia Dickey (Charlotte SA; Charlotte, N.C.), Meagan McClelland (Sky Blue-PDA; Kearny, N.J.). DEFENDERS (6): Maycee Bell (Sporting Blue Valley; Overland Park, Kan.), Messiah Bright (Solar SC; DeSoto, Texas), Madelyn Desiano (UCLA; San Clemente; Calif.), Anna Heilferty (Boston University; Falls Church, Va.), Brianna Martinez (New Mexico Rush; Albuquerque, N.M.), Emily Smith (California; Los Gatos, Calif.). MIDFIELDERS (6): Chardonnay Curran (Oregon; Ewa Beach, Hawaii), Emily Gray (Penn Fusion SA; Sewell, N.J.), Madison Murnin (Central Florida; Jacksonville, Fla.), Jenna Nighswonger (LAFC Slammers; Huntington Beach, Calif.), Delanie Sheehan (UCLA; Brentwood, Calif.), Sakura Yoshida (Reign Academy; Redmond, Wash.).